Alfred Joseph Albert was born on 7 January 1892 at Albany, Albany County, New York. He was the son of Joseph Albert and Eva Wink. 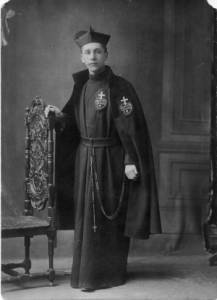 Alfred Joseph Albert was ordained as a Passionist priest, taking the name of Father Egbert Albert, on 18 December 1920 at St Michael's Monastery Church, West Hoboken, Hudson County, New Jersey. Francis Joseph Jennings married Catherine Florence Hans, daughter of John Jacob Hans and Catherine Margaret Albert, on 26 December 1925 at St. Peter's Catholic Church, 313 2nd Street SE, Washington, District of Columbia.3 Father Egbert Albert died on 7 February 1929 at Mercy Hospital, Springfield, Hampden County, Massachusetts, at age 37. Father Egbert Albert was buried in February 1929 at Saint Michael's Monastery Cemetery, Union City, Hudson County, New Jersey. Alfred Joseph Albert was Re-Interred in May 1985 at Holy Cross Cemetery, North Arlington, Bergen County, New Jersey.